Synopsis: Wrongfully convicted for murder, Henri Charriere forms an unlikely relationship with fellow inmate and quirky convicted counterfeiter Louis Dega, in an attempt to escape from the notorious penal colony on Devil’s Island. Review: While I was familiar in passing with Henri Charrière’s semi-autobiographical 1970 novel Papillion and it’s 1973 film adaption starring Steven McQueen and Dustin Hoffman, I’d never dug deep into either source material before taking in the 2018 remake. So I have little to compare and contrast to what has come before. Maybe that’s a good thing, too, because for all the bleakness and cold to the touch emotions the new Papillion employs, it seems like it would make a good rainy day selection for audiences craving something with some substance. 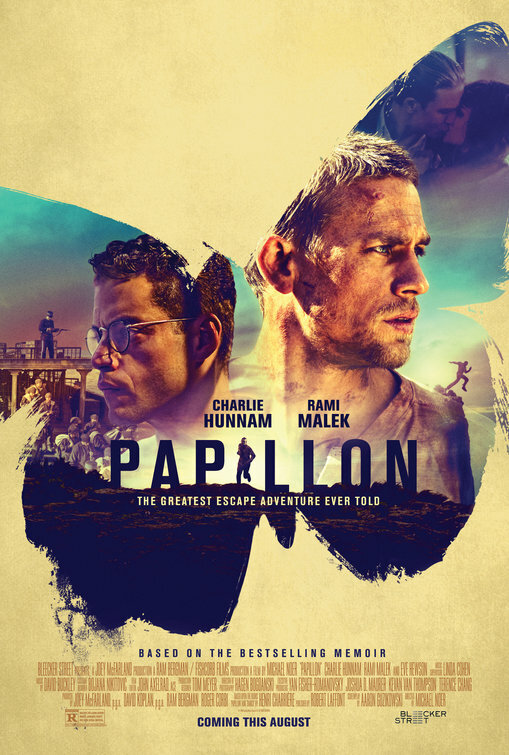 Set between the years of 1933 and 1941, Papillion follows petty thief Charrière (Charlie Hunnam, Pacific Rim) as is he wrongfully convicted of a murder he didn’t commit and sentenced to serve his time on a penal colony in French Guiana. The conditions are terrible and the punishments for disobeying orders (or worse, attempted escape) are brutal. Through a friendship that develops with Louis Dega (Rami Malek, Night at the Museum: Secret of the Tomb) the two men plot an escape from the island prison but face the elements and their own demons along the way. Fans of The Shawshank Redemption might find more than a few similarities between that film and Papillion. Both are set in hellish prisons governed by an imperious warden and feature a colorful set of supporting characters there to alienate our leads at some points and assist them in their quest at others. While the overall message of hope amidst darkness is delivered expertly in Shawshank, it’s a feeling that Papillion can’t quite relay in the same powerful way. Danish director Michael Noer and screenwriter Aaron Guzikowski (Prisoners) speed through Charrière’s life in Paris with his girlfriend (Eve Hewson, Enough Said), eager to get him convicted and en route with Dega to the island as quickly as possible. The journey by boat is a nightmare for the affluent and slight Dega, but buddying up with Charrière gets him the protection he needs to survive until he makes it to shore. The film soon gets into an episodic routine of Charrière looking out for Dega while planning an escape with fellow inmate Celier (Roland Møller, Skyscraper) and suffering various tortures for both efforts. Though he’s often lost among the more popular actors of his generation, I find Hunnam to be a real star sitting right on the brink. He chooses interesting projects (2017’s The Lost City of Z was maybe the most unheralded movie of that year) and commits himself completely to his work (maybe that commitment to material he believes in is why he famously bowed out of a leading role in Fifty Shades of Grey) and that same talent is on display here. Charrière gets put through the ringer and Hunnam ably takes us through every heinous step of his imprisonment. Still, he doesn’t let the character wallow too long and while he maintains some impeccably clean teeth even after years in solitary confinement, his physical and emotional transformation is largely impressive. I still wish I understood why people are trying to make Rami Malek happen as a leading man. He’s supposedly wonderful on TV’s Mr. Robot but I’ve yet to be thrilled by any of the work he’s done on screen. He talks like he has a frog in his throat and maintains skittish tics that feel like nuances derived from Acting 101 textbooks. Malek’s big test will be playing Freddy Mercury in Bohemian Rhapsody later this year and while he’s perfectly fine as the bug-eyed Dega, he’s matched with an actor that strong arms him in more ways than one. The cinematography from Hagen Bogdanski and the production design from Tom Meyer (The Internship) are top notch, putting you right into the heat and horrible conditions within the prison. There’s some wonderfully intricate designs that make you curious to explore the space…an impressive accomplishment as the space we want more time in in a dingy prison and, later, an island cut-off from the rest of the prisoners. Even pushing past the two hour running length, the opening and closing of Papillion feel rushed and unfinished. It’s frustrating for films to feel constructed around attention spans as opposed to story and that dings the effort a bit in my book. Still, Papillion is another film like the recently released Alpha that are better than their meager roll-outs suggest. Like Alpha, it’s a film you’re going to have to work to see and work harder to get comfortable with. Those willing to make that pact are likely to be rewarded.